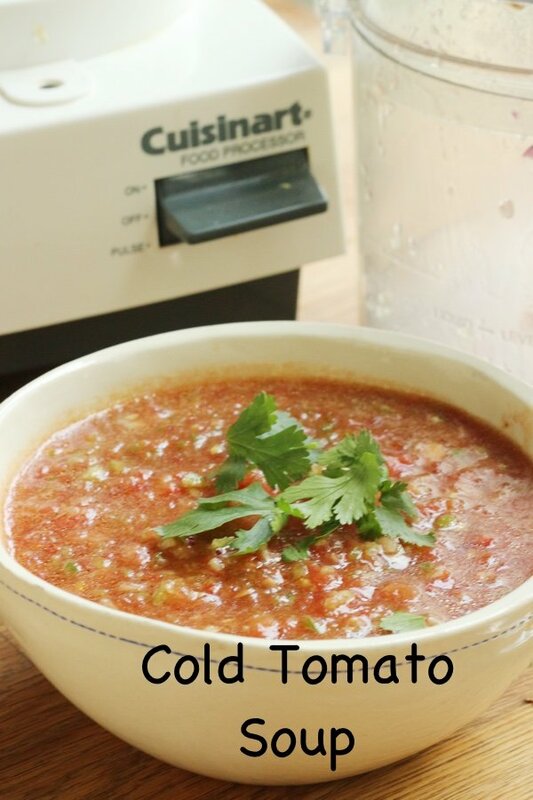 Cold tomato soup is also known as gazpacho. If you haven’t tried a cold soup, now is your moment when the produce is fresh. I have heard that in Spain, they eat some of this cold tomato soup before lunch as a starter. How smart is that? Fill up on lovely vegetables and then eat. We should all give that a try. Would you eat less? Maybe. You would definitely eat healthy. At my farm stand on my street (because I live in the middle of nowhere), I was able to find almost all the ingredients for this soup. 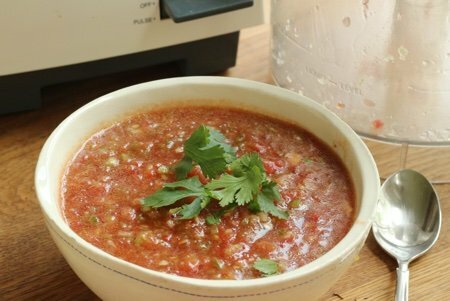 Green pepper, cucumber, tomatoes, red onion, garlic, and some tomato juice are all you need for a basic version. I would like to rename this soup – Cook with Your Food Processor Delicious Tomato Soup – because you don’t actually use a stove or heat. You use your food processor to get the ingredients into a small enough form to make a great soup. I use a high power blender to make my zucchini soup – which is also perfect for summer. I use the sharp blade in the processor to mince the ingredients into small enough pieces for soup. The blade also releases liquid from the vegetables making a cold “broth” for sucking off your spoon. 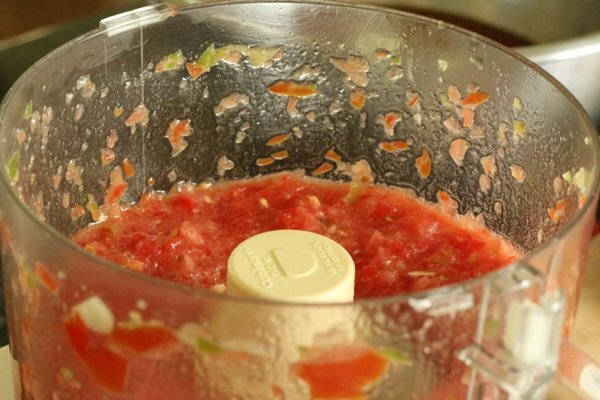 The ripe tomatoes really get macerated and release all of their juices with the food processor. My kids called this “salsa soup” because they said it was like eating salsa. It is not a puree so it does have a salsa mouth feel. I love to serve this on a hot day and slurp it up with some fresh bread or crackers. This cold tomato soup tastes like summer! Keep this soup in your fridge for days and let the flavors steep. It gets really good about the third day. I love to add Tabasco to mine for that extra pop of flavor but feel free to use lime juice, and/or Worcestershire sauce (but no vodka ☺). Do you eat cold soups in summer? What do you make? 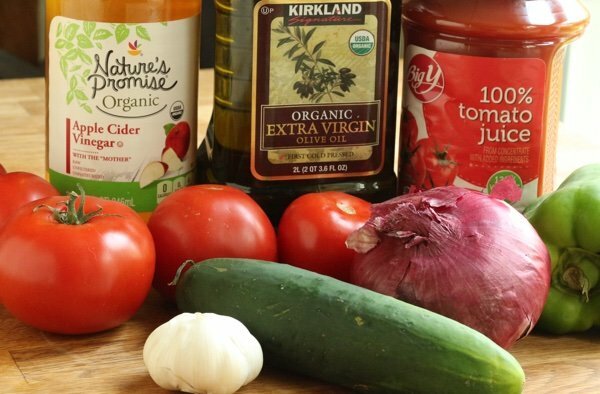 In a large bowl combine the tomato juice, vinegar, and olive oil. Cut the cucumber, pepper, tomatoes, and onion into large chunks. 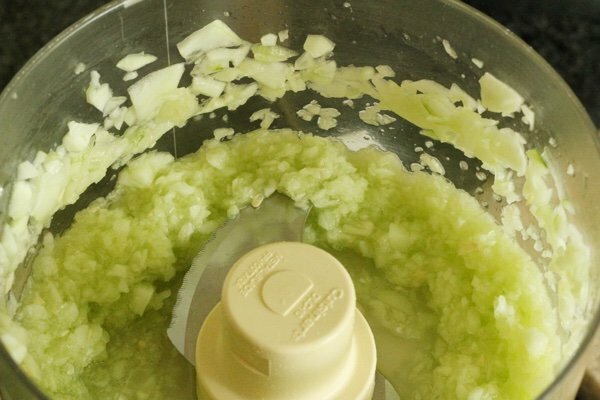 In your food processor, chop the cucumber until minced and put in large bowl. Repeat with pepper, tomatoes, onion, and garlic dumping the food processor into the bowl after each ingredient. Stir the mixture and adjust seasonings by adding salt, pepper, hot sauce, Worcestershire, and lemon or lime juice. Refrigerate until cold and serve. Don’t have a processor. Would blender work as well....maybe pulsing it? Great recipe! This is my personal favorite way to enjoy a bumper crop of tomatoes so I wait 'til August for this treat. I also add celery. Originally I had finely chopped all by hand but nowadays I do half vegetables with juice and add the remaining hand-chopped vegs last for more texture. I also use several add-ins if available, like basil, parsley, mint, or cilantro [or all of them], maybe top with grilled shrimp and garlic croutons [or grilled chiabatta slices brushed with olive oil]. This is a great soup to have made ahead that lasts 2-3 days in the fridge [before cucumber gets weird] because of acidity I think. Mmmmm. can't wait! @Mary - yes, I think pulsing in a blender would work if you cut up the pieces of cucumber, etc. small enough for the blender to mince. If you end up pureeing the veggies - it is still good but a different soup. Excellent question!! Terrific idea! Tomatoes that are cooked have more vitamin impact though. I recommend that the tomatoes be cooked slightly, then add the other ingredients and then refrigerate. This will also thin the soup a little. I love Tobasco sauce too. I use V8 veg juice instead. More flavor in my opinion. Also, think about adding pickle juice or Bragg's apple cider vinegar. Thanks Lisa. Sounds great! Will try today..Thanks, Lisa....wonderful recipes and ideas you give to us. Wow - your Cuisinart looks as old as mine - 1977 or 78. Don't want to jinx it, but it still works! Interessantissima ricetta da preparare adesso, con questo caldo. Provo uno di questi giorni. Grazie mille e a presto. would canned stewed tomatoes work, what do you think?